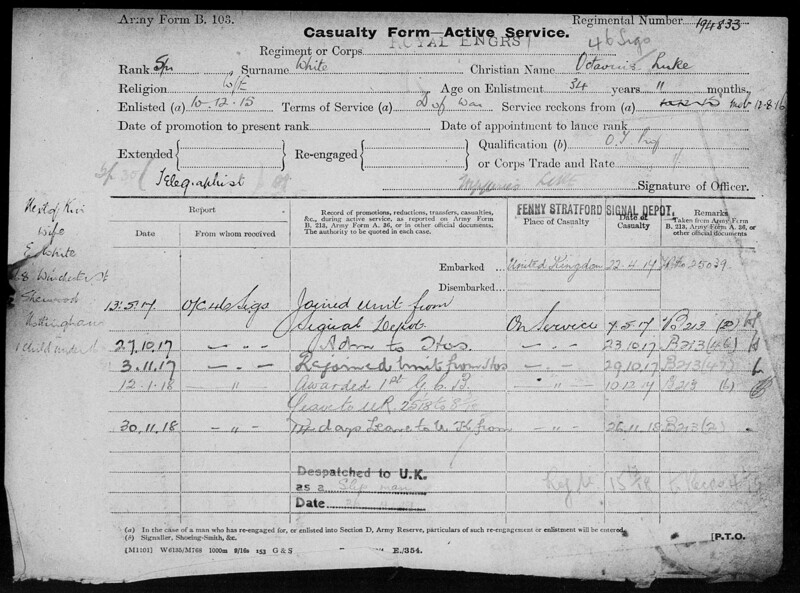 Octavius White, Casualty Form giving detail of his WW1 service record. Octavius White is one of the men named on the Bottesford ‘church list’ of WW1 Servicemen. Octavius Luke White was born on the 2nd January, 1881, and baptised at St Mary’s church on the 11th March, 1881. He was the youngest of three sons of Edward White (born 1833, in Worksop) and Emma White (born 1843, at Sudbrooke, Lincolnshire). They had four boys, including John (b.1876), Lancelot (b.1880) and Octavius (the youngest, b.1881), and two girls, named Louisa (b.1877, described as a ‘teacher in school’ in the 1891 census) and Constance (b.1878). The family lived on the High Street in Bottesford, where Edward White was a druggist and grocer, and had responsibility for the Post Office. In 1901, the family lived at the Post Office, 25 High Street, Bottesford, where Edward was a ‘druggist and postmaster’, Louisa and Lancelot were ‘post office assistants’, and Octavius was a ‘postal clerk’. Octavius White was the best man at his brother Lancelot’s wedding to Myrtle Emily Welbourn in Bottesford on the 6th July, 1910 (reported by the Grantham Journal). Octavius White married Ellen Morgan (b.1882, Derby) on the 14th October, 1908, at Hyson Green parish church in Nottingham. By 1911, they lived at 13 Owthorpe Grove, Sherwood, and had a daughter named May Challands White, born on the 27th July, 1909. Octavius was working as a Post Office clerk. By the time Octavius White enlisted in 1915, he was 34 years old, and his home address was 68 Winchester Street, Sherwood. 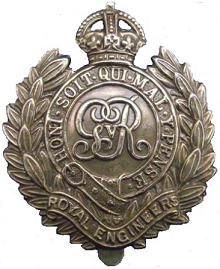 He joined the Royal Engineers as a Sapper, service number 194833, as recorded on his Medal Index Card, but this was not a straightforward process. 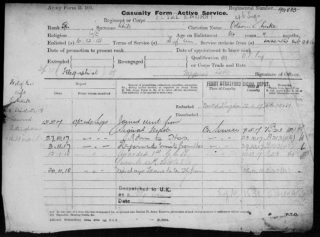 His attestation paper records that he had been a GPO Clerk, and that he first attested on the 10th December, 1915, but was not finally approved of until the 19th August, 1916. He was initially a Private in the Reserves, but was sent to the Royal Engineers Signals Depot at Fenny Stratford. This was the Signal Service Wireless Training Centre, moved to Fenny Stratford, near Dunstable, from Worcester in August 1917 (Long Long Trail website). Here he was trained and then tested as a Telegraphist. At first he was graded as ‘indifferent’ on the 17th August 1916. He was not re-graded as ‘proficient’ until the 1st of November, when he was ‘remustered’ as a Sapper. In 1917, he was drafted into the BEF from the Fenny Stratford Depot. He joined 46 Signals on the 7th May, 1917, and remained in France until despatched back to the UK on the 15th December, 1918. He was in hospital briefly, from the 23rd to the 29th October, 1917. Octavius White was on the lists of Absentee Voters of 1918 and 1919, his address 68 Winchester Street, Mapperley, his military designation 194833 Sapper, 138th Brigade, Royal Engineers. The 46th Signals Company was part of the 46th (North Midlands) Division, which took part in many actions including the Battle of Hill 70 in 1917, and in 1918 the Battles of Cambrai, the Selle and the Sambre. Soon after the armistice came the sad announcement of the death, on the 19th November at Bottesford, of “nine-years old May Challands, the dearly loved and only child of Octavius and Ellen White of 68, Winchester Street, Sherwood – Loved by all” (Nottingham Evening Post, 23rd November, 1918). Octavius was demobilised at Chatham on the 25th May, 1919. Ellen White died in 1963, also in Nottingham. The house at 68, Winchester Street, Mapperley, remained Octavius and Ellen’s home until 1925, but from 1926 they lived at 59, Sherwood Vale, Mapperley. They were still at this address in 1939, when he gave his occupation as ‘Post Office Overseer, Nottingham’, and they were to remain there into the 1950s. In 1941 (Nottingham Journal, 20th March 1941), the King awarded the Imperial Service Medal to Octavius White, the overseer, Nottingham Post-Office. Octavius White died on 8 January, 1958, in Nottingham, aged 77.